Heat oven to 350°F. Spray bottom and sides of 15x10x1-inch pan with cooking spray. In small bowl, mix flour, baking powder and salt; set aside. In large bowl, beat 1 cup softened butter and the granulated sugar with electric mixer on medium speed 2 minutes, scraping bowl occasionally, until fluffy. Beat in jam. Beat in eggs, one at a time, just until smooth. Beat in 1 teaspoon vanilla and the food color. On low speed, beat in one-third of the flour mixture, then half of the milk, beating after each addition, just until smooth. Repeat with flour mixture and milk, ending with flour mixture, scraping side of bowl occasionally. Spread batter evenly in pan. Tap cake pan on counter 2 or 3 times to eliminate air bubbles from batter. In medium bowl, beat Frosting ingredients with electric mixer on medium speed until smooth and creamy. Scrape side of bowl occasionally. Spread on top of cake. 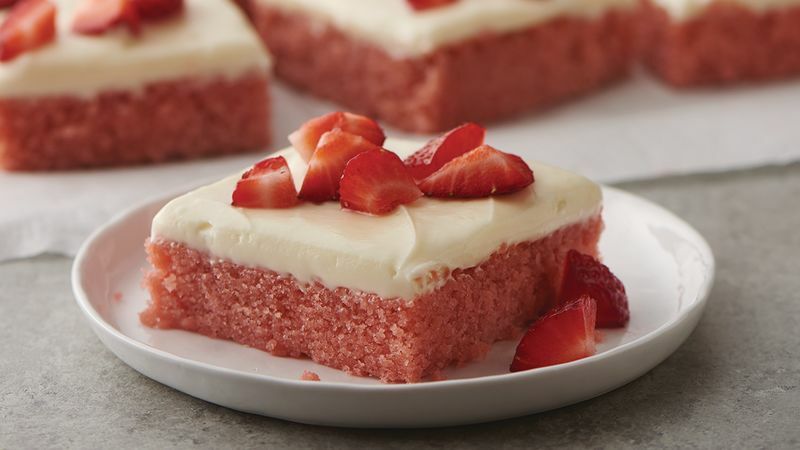 When ready to serve, sprinkle strawberries on top. To serve, cut into 6 rows by 4 rows. Store loosely covered in refrigerator. To quickly soften cream cheese, remove from wrapper, and place on microwavable plate; microwave uncovered on High about 15 seconds or just until softened. Jam differs from preserves in that the texture is a thick puree rather than chunks of medium to large fruit pieces.